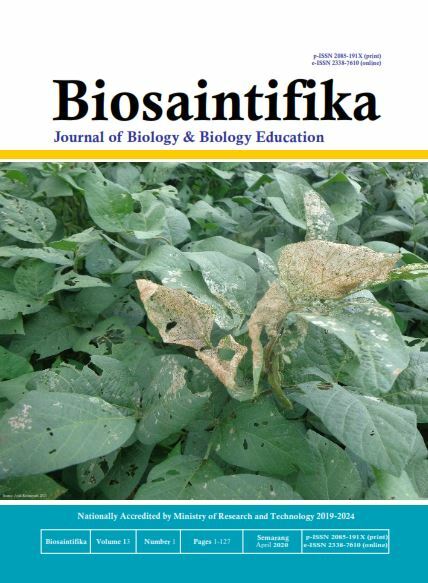 Biosaintifika: Journal of Biology & Biology Education [p-ISSN 2085-191X| e-ISSN 2338-7610] published scientific papers on the results of biology and biology education research (see Focus and Scope). Editor accepts the article has not been published in other media with the writing format as listed on page manuscript writing guidelines (see Author Guidelines). The journal has been indexed in Google Scholar, Microsoft Academic, DOAJ, DOI Crossref, EBSCO, CABI, SINTA 2 and published three times a year, on April, August & December and published by Department of Biology, Faculty of Mathematics and Natural Sciences, Universitas Negeri Semarang Perhimpunan Biologi Indonesia in collaboration with Perhimpunan Biologi Indonesia Tingkat Pusat. Articles in press are peer reviewed, accepted articles to be published in this publication. When the final article is assigned to volumes/issues of the publication, the article in press version will be removed and the final version will appear in the associated published volumes/issues of the publication. The date an article was first made available online will be carried over. Please be aware that, although articles in press do not have all bibliographic details available yet, they can already be cited using the year of online publication and the DOI, as follows: author(s), article title, Publication (year), DOI.